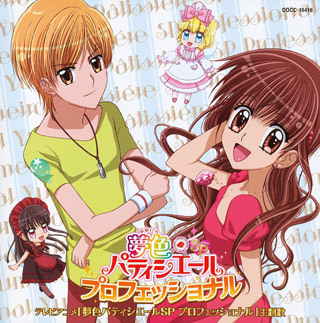 Here's a word to the wise: if you're trying to lose weight, don't watch Yumeiro Patissiere. 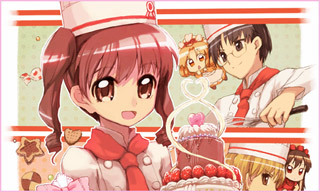 After watching Team Ichigo make all manner of indulgent layer cakes, tarts, and chocolate confections, you are going to want dessert something fierce, and heaven help anyone who gets between you and your sweets. Of course, we rather like our pastries here; those of you virtuous types who usually skimp on the sugar (or perhaps just have much better willpower than we do) may find the show safe to watch on a diet. 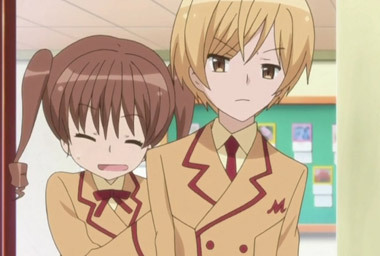 In addition to its dangerous implications for your blood sugar, this might just be the girliest anime ever- and we mean that in the nicest possible way. 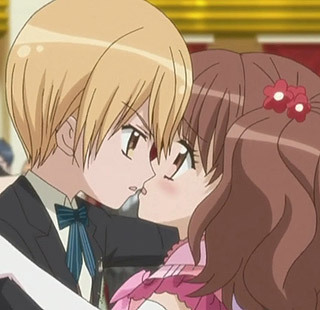 Between the stable of cute boys with pastel hair colors who dote on our plucky heroine, a group of adorable, pocket-sized fairies who live to make pudding, and an emphasis on character relationships over plot, it's hard to get more shoujo than this. It's almost disconcerting that our main gal Ichigo (not to be confused with the main character from Bleach) is a brunette, as opposed to sporting some fabulous pink hair. 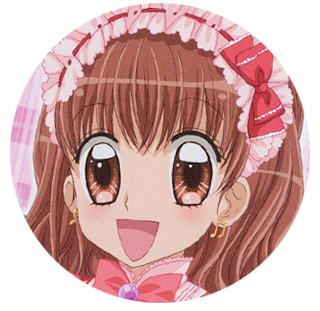 Our heroine is sent to St. Marie's Academy, a school for budding pastry chefs, when respected Chef Henri notices what a great palate she has. 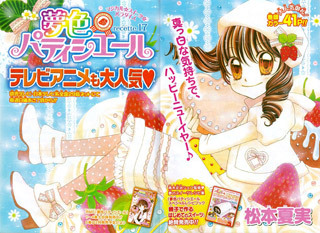 Ichigo, who has no particular talents as far as she can tell, is pleased that her gluttonous love of desserts could turn into something useful, but is quickly overwhelmed when she's suddenly expected to bake at the level of everyone else in school. 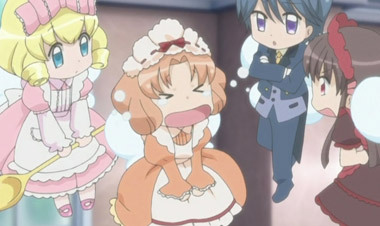 For better or for worse, Ichigo is paired with the best chefs in school, a group of boys called the "Sweet's Princes" (because apparently, a good word from Chef Henri goes a long way), meaning this intuitive but inexperienced chef sees her dream opportunity quickly become a trial by fire. 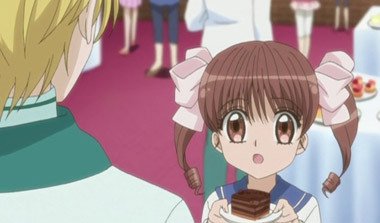 While Ichigo is a fairly typical shoujo protagonist, we found her particular talents- sensitive taste buds, and a gift for anticipating what the "client" wants in their desserts- fairly interesting. You can only watch a protagonist who is skilled in battle, or a genius, so many times, but it's not often you see a character out-taste their opponent. 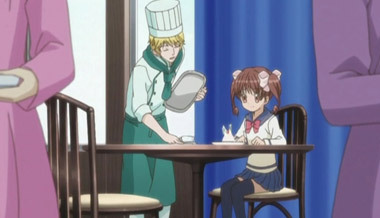 Often, Ichigo's superior palette doesn't make much of a difference, since all her fellow chefs are no slouches in that area as well; it's her creativity that allows her to survive at St. Marie's, and that alone makes for more satisfying viewing than watching a protagonist overpower someone with sheer skill. 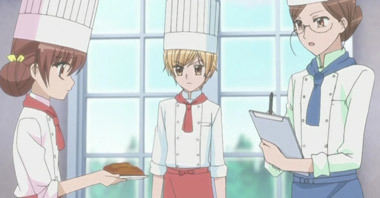 Ichigo's creative approach to desserts allows for an interesting theme in Yumeiro Patissiere: while we don't want to give the impression that the series is deep by any means it's not, nor does it need to beóthere does seem to be some criticism of the classic French approach to cooking throughout the show. Ichigo makes great desserts not because she can demonstrate great technique or make a pastry that meets certain predetermined criteria, but because she personalizes everything she makes to create the best experience possible for whomever she's baking for. The idea of there being one "right" way to make a dessert doesn't fit with her people-pleasing worldview. There's also an examination of the contrast between more flashy, upscale desserts, and homier fare, like traditional Japanese sweets. 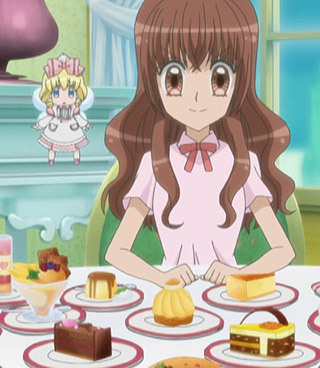 Talking about the ideology of desserts might sound silly to anyone who isn't already a serious dessert fiend or a pastry chef, but the show definitely engages it's subject matter from multiple perspectives; a real selling point in a show that can seem very childish at first. Speaking of children, the spoon-wielding Sweets Spirits, basically tiny fairies who come from a land not unlike the Candyland boardgame, are bound to make little girls clap their hands in delight, but we were unsure about their role in the show: the story of a girl transferring to a school where the coursework is very challenging and has to slowly win the trust of her peers was compelling enough, we thought the show didn't necessarily need any kind of magical subplot. 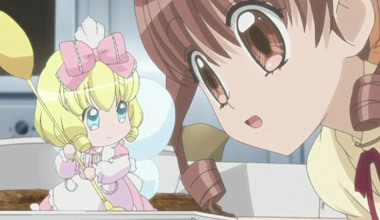 Some viewers, particularly males, who might have been willing to watch a show about pastry craft may be turned off by the cutesy fairy hijinks. Furthermore, it seemed like the Spirits weren't used as well as they could be: they make for some great jokes, but stories that focused on them tended to be disappointments. 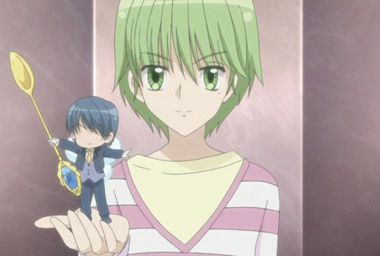 For example, we adored the charming Café- the only male Sweets Spirit we see-- only to get bored waiting for him to have a chance to get his own storyline. Don't get us wrong: we loved watching the Spirits dance, fight duels with their spoons and fall into molds filled with cake batter, but that whole aspect of the show felt a little tacked on. 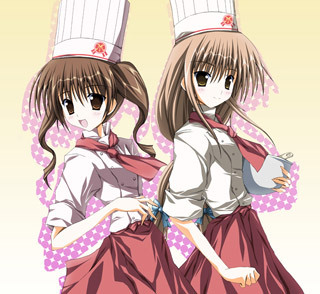 We're holding out for Café: The OVA. 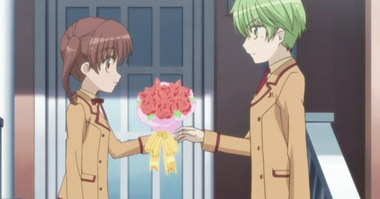 Of course, a show this shoujo isn't for everyone; some male viewers will probably be turned off by the sheer cuteness of everything, and we would be lying if we didn't admit that the show's omnipresent sweetness (on all fronts) didn't cross the line into saccharine territory at times. Also, sometimes the morals of the various storylines can cross the line to becoming too obvious, at least for older viewers. Furthermore, while we liked the art style, the music and animation are thoroughly average throughout. 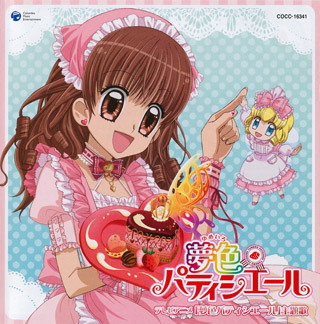 However, if you enjoy eating dessert, enjoy making dessert, enjoy watching other people make dessert, and especially if you enjoy Top Chef: Just Desserts (which actually premiered after Yumeiro Patisserie, which first left its confectioner's sugar-dusted mark on anime in the Fall of 2009), this is still a pretty entertaining anime. Since you learn all about different types of desserts, you can even pass it off as educational! Okay, maybe that's stretching it, but we did learn what a Sachertorte is: look it up, it sounds delicious. 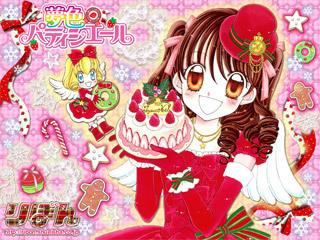 Below: Scenes from Yumeiro Patissiere. 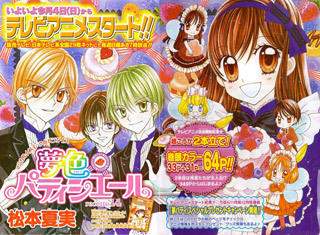 Below: Promotional illustrations for Yumeiro Patissiere.